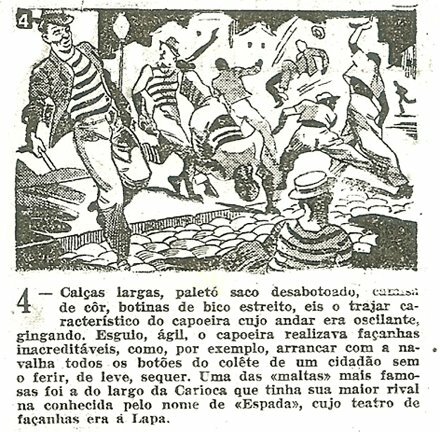 When observing old pictures, trying to get a glimpse of what old (Carioca) capoeira looked like, one must be careful; because there are also 'fake' pictures. 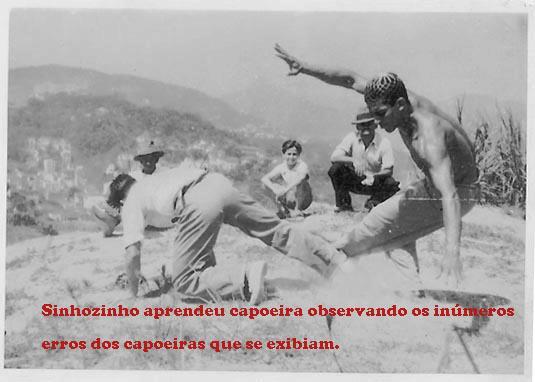 Before showing some of them, let me say that a proper picture of historical Capoeira is of immense value. These pictures are a lot more valuable than any photograph; because a photograph mechanically captures one moment of a technique, usually a random, accidental moment at that. On the contrary, if an author wanted to draw a carricature of capoeiras, he had to understand the technique he was trying to portrait; to know it upside down, probably doing countless artistic studies of it etc. Then he synthetised this knowledge into a single picture that, according to him, showed the essence of that technique. In other words, you can photograph a thing without understanding it; but in order to draw it well, you have to understand it minutely. You cannot say to a wild capoeira 'ok, please stand in the final position of rasteira until I sketch it...'. You have,to a certain extent, to be able to do a rasteira yourself. This is why old carricatures of capoeira are so valuable. People confuse them with photos; but they are completely different. Different in that they show essences, not just accidents. The artists knew the techniques, and had them down to such details as whether the elbow is bent or not, whether the hand is in front of body or not, whether the foot is on the toes or not etc. You can appreciate these details after you are able to do the techniques yourself. Ok, so what about the fake drawings? I was quite surprised to discover that some of the drawings of 'old capoeira' are, in fact, just retraced photos of the capoeira in the 50's(? ); with the author adding ganster trappings and straight razors to the practitioners. A gangster type doing a rasteira vs common guy doing a rasteira god knows where. The drawings are clearly based on the pictures. That means one thing - they are not drawings of old capoeira. They are drawings of new capoeira, masquerading as the old one; ie they are very anachronistic. One must be careful not to base his picture of the old capoeira on them. The same can be said about the anachronistic capoeira portrayed in movies and other media. 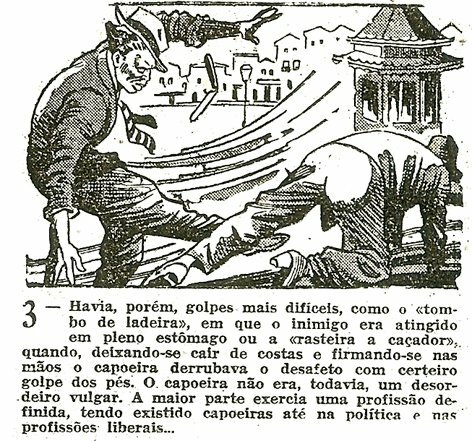 For example, in the recent movie Besouro, the protagonist (supposed to be situated in the first half of 20th century) is shown doing movements and techniques right out of the today's Abada school. Of course, this is understandable, as this is a popular movie. However, it can easily mislead people into thinking 'capoeira hasn't changed much'. But it did. Contemporary capoeira of 'the movie Besouro' would look foreign to Bahians in the 1970's; much more foreign to capoeira in earlier times.